At Atrium Family Dentistry, we want to partner with patients of all ages as they work towards healthier, happier smiles that last a lifetime. Visiting the dental office shouldn’t have to be an unpleasant experience – your comfort and satisfaction are always important to Dr. Sherif Albert, Dr. Alyssa Stylski, and Dr. Christine Snow! We take the time to truly understand your reasons for visiting and form trusting relationships. Whether you’re looking to rebuild teeth after traumatic loss or are simply overdue for a routine dental checkup, our advanced clinical skills and genuine warmth will be sure to leave you smiling. Tooth loss can be a severe strain on a person’s health, day-to-day wellbeing, and overall quality of life. 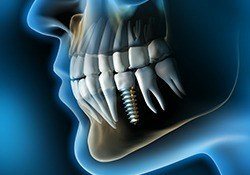 If you haven’t heard of dental implants yet, our doctors would love to enlighten you about the valuable, lifelong advantages of this state-of-the-art reconstructive procedure, available right here at Atrium Family Dental. Unlike more traditional tooth replacement services, implants are designed to replicate every part of the natural dental anatomy, providing unparalleled stability and aesthetic value. They can last for several decades or even the rest of your life! Dentistry is always in a state of rapid evolution, and the Atrium Family Dental team works hard to stay right at the cutting edge of new techniques and technologies for the patient’s sake. 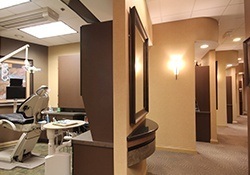 Our office is outfitted with countless modern tools, from educational intraoral cameras to a state-of-the-art Cone Beam for comprehensively precise X-rays. Achieving straighter teeth can be a struggle for older, image-conscious adults. After all, as a professional, a mouthful of metal braces isn’t exactly what you want to be showing off day after day – but what if there was another way? 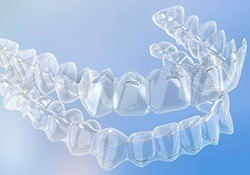 Our New Lenox practice offers Invisalign®, which uses clear, removable aligners to gradually shift your smile as desired. They’re barely noticeable when worn, which means you can still enjoy a high level of self-confidence throughout the treatment process. When visiting a new dentist’s office, the last thing patients want to hear is that they’ll need to travel to a separate specialist for the care they really need. 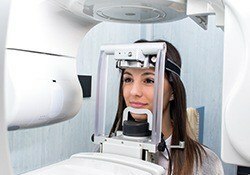 Here in New Lenox, our doctors offer a comprehensive menu of services to avoid this inconvenience whenever possible, including several specialty options that can’t be found in just any practice. Dr. Albert’s extensive skills in restorative and cosmetic dentistry make it possible for revitalize teeth, undergo stunning smile makeovers, and receive essential preventive care all in one location. One of our top goals is to help every patient feel genuinely at ease throughout their appointments, and the talented team members here at Atrium Family Dental do a great job. 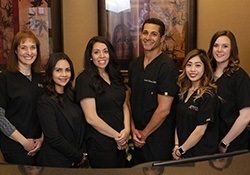 Every coordinator, assistant, and hygienist is not only highly experienced and adept at their positions, but also unfailingly warm and friendly. They’ll be happy to answer any questions, assuage worrisome concerns, and simply chat with you about your needs to make sure you leave smiling. 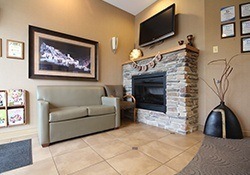 Work, school, family time – our schedules are booked tight most days, leaving little room open for important dental care. 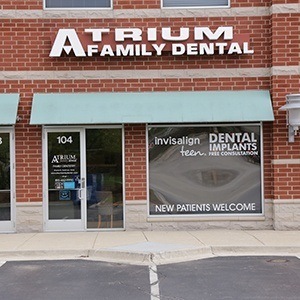 At Atrium Family Dental, we strive to offer much-needed flexibility to our valued patients instead of requiring them to conform to an overly restrictive schedule. That’s why our dental office has available appointment times until 7:00pm on Mondays and Tuesdays, as well as early morning hours starting at 7:30am on Wednesdays.